When you bring your car in for service or repair, the mechanic will use some kind of diagnostic equipment to see if there are any recorded problems. Modern cars come equipped with computer processors, microchips and sensors which can be hooked up to diagnostic computer scanning software. Car Diagnostics tools and software help the car mechanic locate problems and identify error messages (such as those that “pop up” on your dashboard) more quickly and more accurately and thus helps reduce repair time. A diagnostic “scan” can identify things like: engine issues, ignition problems, fuel injector performance, engine rpm levels, crankshaft and camshaft position, air and coolant temperatures, etc. 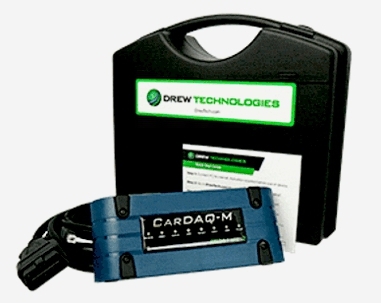 Not to be too technical, we utilize CarDAQ-M® programming by Drew Technologies. This provides us with complete SAE J2534-1 and J2534-2 “pass-through” capabilities for all vehicle makes and models. These devices are the most tested, validated and accepted around the globe by technicians, etc. The particular diagnostic leak detector tool we use to find these kinds of leaks, is Redline Detection’s “Smoke Pro®. 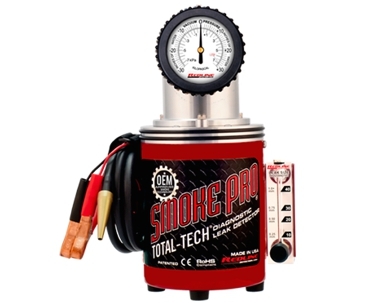 This tool improves accuracy in our repairs and greatly helps us reduce diagnostic time. It can also detect any exhaust system leaks. For most cars, we recommend you have it tested using Car Diagnostics at least once a year.